For all its bewildering array of data, cricket statistics still has a few blind spots. One of the most obvious is in the area of missed chances, where there have been few extensive studies. Gerald Brodribb in Next Man In mentioned that statistician RH Campbell estimated that 30% of catches were missed in Tests in the 1920s. I have seen a figure of more than 30 dropped catches by West Indies in Australia in 1968-69, a team plagued by poor fielding. But really basic questions like "Overall, what percentage of chances are dropped?" lack answers. For a number of years I have collected all the missed chances I could find in ESPNcricinfo's ball-by-ball texts for Test matches. Since the site does not always use standard terms to describe missed chances, and different ball-by-ball commentators have their own ways of expressing themselves, I searched the text for 40 or more words and phrases that might indicate a miss, from "drop" and "dolly" to "shell", "grass" and "hash". The process generally flagged about 100 to 200 lines in the commentary for each Test, which I then searched manually to identify real chances. For some Tests, I also confirmed data by checking match reports and other ball-by-ball sources. While the commentary goes back to 1999, the textual detail can be patchy in the early years. I logged missed chances from late 2000 onwards, but consider that data to be substantially complete only from 2003. 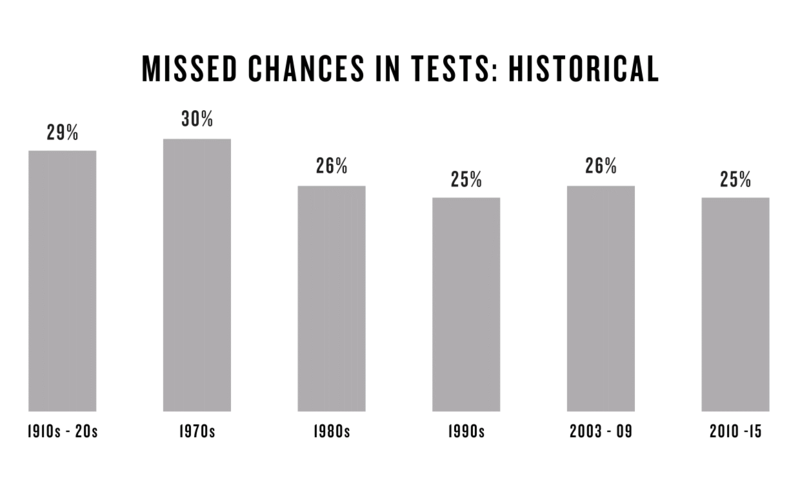 I have compiled a list of over 4000 missed chances in Tests from this century; about a third of all Tests (635) are represented. Unavoidably, there are caveats. Sometimes opinions may vary as to whether a chance should be considered a miss. I take a hard line: "half", "technical" and "academic" chances are included, and I try to include any chances where the fielder failed to touch the ball but should have done so, if they can be identified. 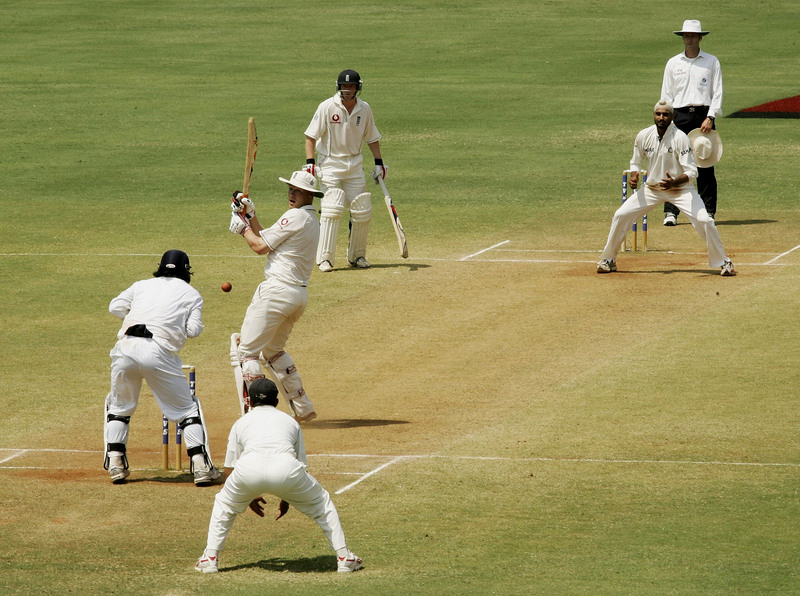 Edges passing between the wicketkeeper and first slip are considered chances even if no one has touched the ball. Since 2005, I have divided chances into two categories, "normal" and "difficult", according to how they are described. About half fall into each category. There will always be uncertainty about some dropped catches, as there is always the possibility that some others have been overlooked. However, as long as the collection method is as consistent and exhaustive as possible, I would argue that a great majority of misses have been identified and that the data can be collated into useful statistics. So back to the original question: how many chances are dropped? The answer is about one-quarter; typically seven missed chances per Test. Here is a table showing missed chances by country. The difference between the top three countries in the last five years is not significant; however, there are more substantial differences down the list. Generally, Bangladesh have had the weakest catching record since they started in Test cricket, although there are recent signs of improvement. Other countries have had fluctuating fortunes. West Indies had a miss rate of over 30% from 2003 to 2009, but have tightened up their game in the last couple of years. India have seen a rate of 33% in 2013 fall to 23% in 2015, and Sri Lanka have also improved their catching significantly in just the last two years. In some years, countries like Australia, South Africa and New Zealand have seen their rates drop below 20%; the best single-year result was 16.9% by South Africa in 2013, when they were the No. 1-ranked team in Tests. In good years, the proportion of dropped catches rated as "difficult" generally increases; good teams still miss the hard ones but drop fewer easy ones. Typically, two-thirds of Australia's missed chances are rated as difficult, but the same applies to only one-third of Bangladesh's missed chances. As a batsman's innings progresses, the odds of him offering a chance increase. About 72% of batsmen reaching 50 do so without giving a chance, but the percentage for century-makers is 56% in the first 100 runs. Only 33% of double-centuries are chanceless in the first 200 runs. The highest absolutely chanceless innings is 374 by Mahela Jayawardene in Colombo; Lara's 400 in Antigua contained a couple of "academic" chances. The most expensive missed chance since the start of 2000 is 297 runs for Inzamam-ul-Haq, who made 329 after being missed on 32 in Lahore in 2002. Historically there have been more expensive misses: Mark Taylor (334 not out) was dropped on 18 and 27 by Saeed Anwar, and there was a missed stumping on 40 for Len Hutton (364) in 1938. Perhaps even luckier was Kumar Sangakkara, who made 270 in Bulawayo after being dropped on 0. 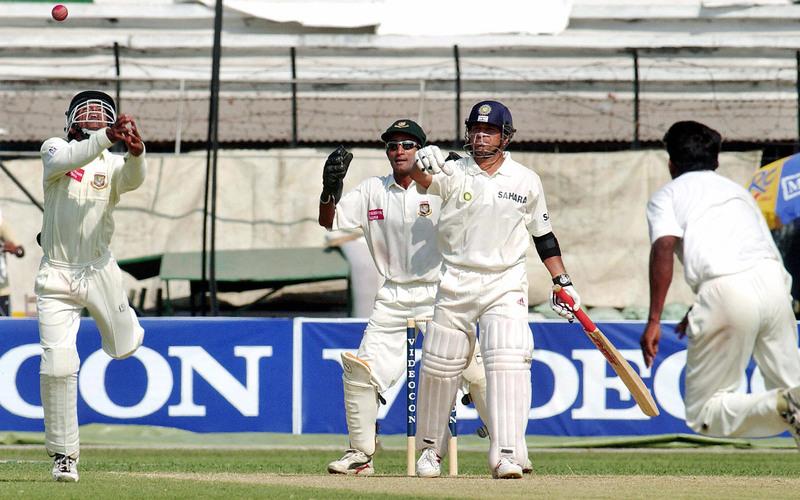 Sachin Tendulkar was dropped on 0 when he made his highest score, 248 not out in Dhaka. Mike Hussey gave a possible chance first ball at the Gabba in 2010, and went on to make 195. Graham Gooch was famously dropped by Kiran More when on 36 at Lord's in 1990. He went on to make 333. The data turns up four batsmen who have been dropped five times in an innings: one was Andy Blignaut, whose 84 not out in Harare in 2005 included an extremely rare hat-trick of dropped catches; Zaheer Khan was the unhappy bowler. (There was also a hat-trick of missed chances at Old Trafford in 1972, when two batsmen survived against Geoff Arnold.) The others who have been missed five times are Hashim Amla (253 in Nagpur, 2010), Taufeeq Umar (135 in St Kitts, 2011) and Kane Williamson (242 not out in Wellington, 2014). Nothing in this century quite matches the seven or eight missed catches (reports vary) off George Bonnor when he made 87 in Sydney in 1883, or six misses off Bill Ponsford in his 266 at The Oval in 1934 (as recorded by veteran scorer Bill Ferguson). Wavell Hinds was dropped twice at the MCG in 2000, and still made a duck. The batsman with most reprieves in the study period is Virender Sehwag, missed 68 times, just one ahead of Sangakkara. About 37% of the chances Sehwag offered were dropped, which is well above average and probably a testament to the power of his hitting. 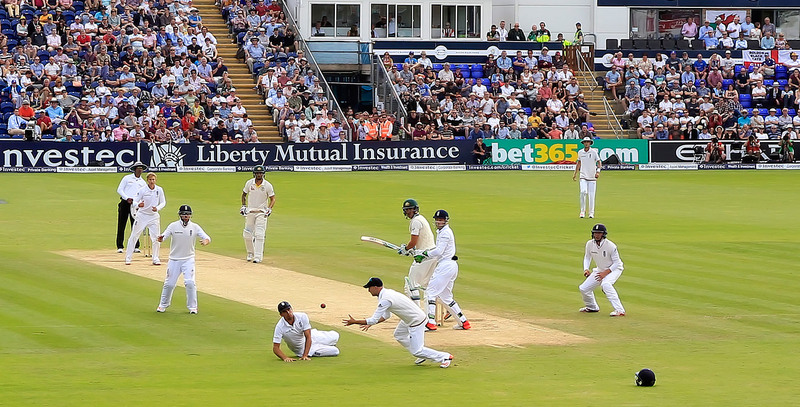 Broadly, spin bowlers suffer more from dropped catches and (of course) missed stumpings. Chances at short leg, along with caught and bowled, have the highest miss rates among fielding positions, and these positions happen to feature more strongly among spinners' wickets than pace bowlers'. Overall, 27% of chances off spin bowlers are missed, as against 23% of chances off pace bowlers. In the study period, the bowlers with the most missed chances in Tests are Harbhajan Singh (99) and Danish Kaneria (93). Harbhajan has had 26 chances missed at short leg alone. Bear in mind that these bowlers' careers are not fully covered; the data for about 10% of Harbhajan's career is not available to analyse. Pace bowlers with the most misses, as of January 2016, are Jimmy Anderson (89) and Stuart Broad (85). Spare a thought for James Tredwell, who has played only two Tests but suffered ten missed chances, including seven on debut, the most for any bowler since the start of 2000. Most were very difficult, with three of them missed by the bowler himself. Also worth mentioning is Zulfiqar Babar, who has had 30 chances missed in his Test career and only 28 catches (and stumpings) taken. At the other end of the scale, Adil Rashid has had eight catches taken off his bowling with no misses (as of August 2016). Neil Wagner of New Zealand has had only seven misses out of 63 chances, a rate of 11%. Two bowlers have had catches missed off their first ball in Test cricket: David Warner (Dean Brownlie dropped by James Pattinson, Brisbane, 2011) and RP Singh (Shoaib Malik dropped by Anil Kumble, Faisalabad, 2006). When it comes to catching, some positions are much more challenging than others. That will come as no surprise, but putting some numbers to this is an interesting exercise. The table below shows the miss rate for different field positions. The highest miss rates are seen for caught and bowled, and for catches at short leg. Bowlers lack the luxury of setting themselves up for catches, while short leg has the least time of any position to react to a ball hit well. Many of the chances there are described as half-chances or technical. 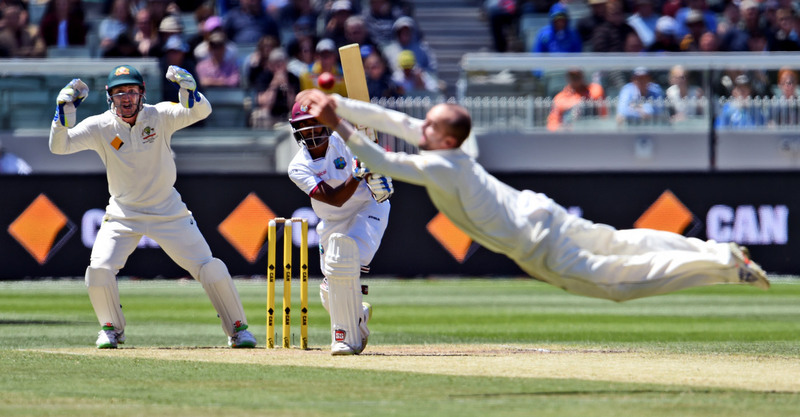 Slips catches are twice as likely to be dropped as wicketkeepers' catches, a measure of the advantage of gloves. However, it would be unwise to read too much into the table above. Slip fielders or short-leg fielders are not inferior to those at mid-off; they get much more difficult chances. In the period of the study, Alastair Cook missed more chances than any other non-wicketkeeper, some 62 misses, but since many of his misses came at short leg, his miss rate doesn't look so bad. While comparing lapse rates of different fielders is risky, it is worth mentioning Graeme Smith, whose drop rate of only 14% is the best among long-serving players by a considerable margin. 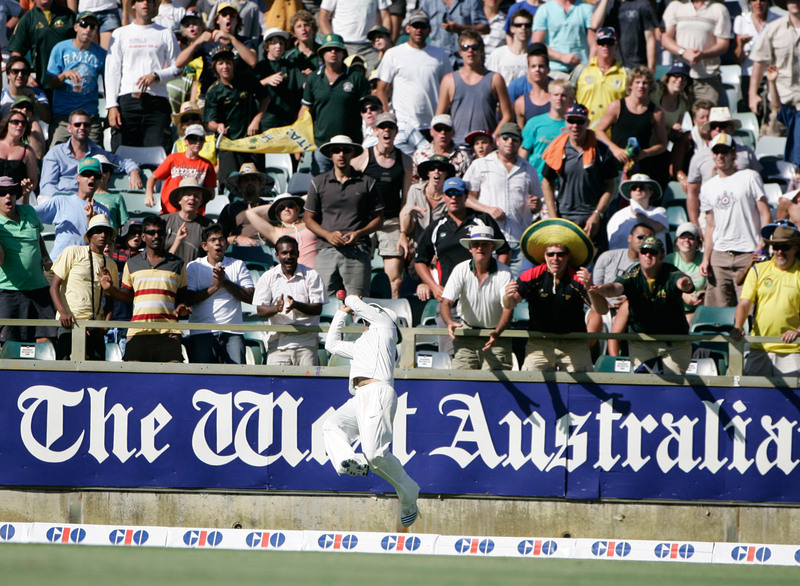 Between August 2012 and February 2013, Smith took 25 catches and recorded no missed chances. Other slip fielders with outstanding catching records include Andrew Strauss and Ross Taylor on 20%, Michael Clarke on 21%, and Ricky Ponting on 22%. Elsewhere in the field, Warner at one stage took 20 consecutive chances that came to him. Of those who have recorded more drops than catches, Umar Gul leads the list, with 11 catches and 14 misses. In 2014, Mushfiqur Rahim missed ten consecutive chances that came his way. Oddly enough, he caught his next 13 chances. Kevin Pietersen came to Test cricket with a fine catching reputation, but he dropped the first seven chances that came to him. He then caught his next 16 chances. The most missed chances in a match for one team, in this data set, is 12 by India against England in Mumbai in 2006. 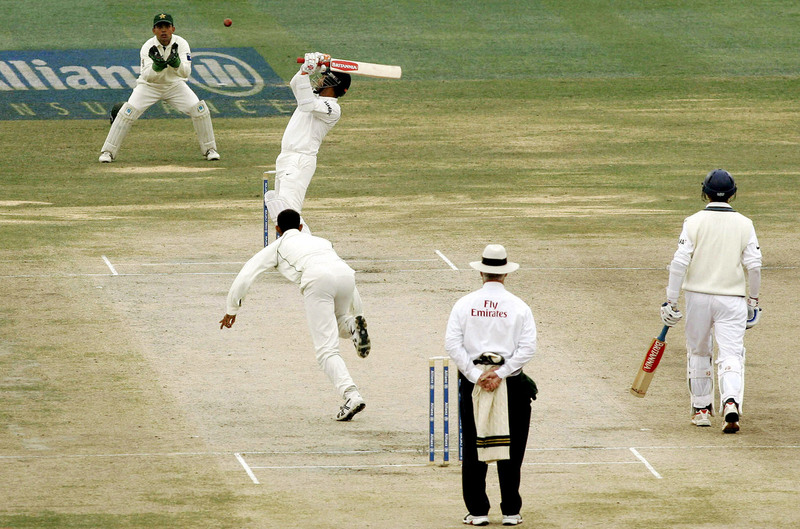 The most missed chances in an innings is nine by Pakistan against England in Faisalabad in 2005, and also by Bangladesh against Pakistan in Dhaka in 2011. In Karachi in 2009, Mahela Jayawardene (240) was dropped on 17 and 43, Thilan Samaraweera (231) was dropped on 73 and 77, and Younis Khan (313) was dropped on 92. The combined cost of all the missed chances in the match was 1152 runs, or 684 runs based on "first" drops off each of the batsmen. There is some evidence of "contagious" butterfingers in teams. In the second Test of the 1985 series in Colombo, India dropped seven catches against Sri Lanka on the first day, on which the only wicket to fall was thanks to a run-out. India also dropped six catches in the space of ten overs in Rawalpindi in 2004, five of them coming in the first hour of the fourth day. It is rare enough for six chances to be offered at all in the space of ten overs at all, let alone to see all of them missed. Here is some data on the miss rates, including stumpings, of various wicketkeepers of the 21st century. Not all are listed, but those with particularly low or high drop rates are given. The wicketkeeper with the most misses is MS Dhoni with 66 (18%). In his defence, Dhoni had to deal with a high percentage of spin bowling, which presents a much greater challenge for keepers. Miss rates for leading wicketkeepers off spinners average around 30%, for both catches and stumpings, but it is only 10% for catches off pace bowlers. It can certainly be argued that keeping to spinners is the true test of a keeper. It is not uncommon for keepers to start with a bang but fade later in their careers. Boucher, Watling, Gilchrist and de Villiers all had miss rates in single digits earlier in their careers. Gilchrist's miss rate rose in the last couple of years before his retirement. Others with very low rates, who did not qualify for the table, include Peter Nevill and Chris Read, on 7%. Read, to my eye, was one of the best modern wicketkeepers, but he did not get very many opportunities since he was unable to score enough runs to hold his place. In addition to the data for the 21st century I have gathered data from other periods of Test history, using scorebooks that recorded dropped catches. The best sources are scorebooks by Bill Ferguson in the 1910s and 1920s, and by Bill Frindall from the early 1970s to the late 1990s. I have also used a limited number of other sources, including scores by Irving Rosenwater and some by Pakistan TV scorers. I have extracted data from about 200 Test scores in all, dating from before 1999. Again, there must be caveats. We cannot be sure that the judging of dropped catches was on the same terms throughout, and we cannot be sure of the effect of TV replays on these assessments. I would say, however, that in the case of Frindall we have a meticulous observer with a very consistent style over multiple decades. Once again, it would be unwise to read too much into each little blip in the data, but in general there is a trend toward lower rates of missed chances. The trend would probably be steeper if the data was limited to Australia and England, as the recent data includes countries such as Bangladesh that have had little or no coverage in earlier decades. I might add an opinion from decades of observation: I believe that the greatest area of improvement has been with weaker fielders. Today everyone, including those with limited skills, has to do extensive fielding drills and take that part of the game very seriously. This has been one effect of the one-day game. In past decades many took fielding seriously. Jack Hobbs, Don Bradman and Neil Harvey worked hard at it, and I doubt if any player today works as hard on fielding as Colin Bland did in the 1960s (Bland would spend hours picking up and throwing a ball at a single stump: his record of run-outs is superior to that of anyone today). However, there were also players who did much less work on their fielding skills. In the modern game there is nowhere to hide, and everyone must put in the training effort. As a result, overall standards have risen.